George Washington Saunders. Courtesy of the University of Texas Press. Image available on the Internet and included in accordance with Title 17 U.S.C. Section 107. News Article on George W. Saunders and his Livestock Commission Company, featured in the San Antonio Express, February 24, 1920. Courtesy of the Portal to Texas History. Image available on the Internet and included in accordance with Title 17 U.S.C. Section 107. SAUNDERS, GEORGE WASHINGTON (1854–1933). George W. Saunders, cattleman, the son of Thomas Bailey and Elizabeth Emily (Harper) Saunders, was born in Rancho, Texas, on February 12, 1854, the sixth of eleven children. His father had moved from Fayetteville, North Carolina, to Gonzales in 1850. By December 1859 the family had resettled in Goliad County, where young George helped run the family ranch, located twelve miles from Goliad. On his tenth birthday his father gave him ten calves, branded with the Half-circle Ten to distinguish his cattle from those of his brothers. He attended Covey's College at Concrete. George began driving cattle in 1871 to Kansas and drove many more to the Texas Gulf Coast, New Orleans, Mexico, and northern markets. In 1874–75 he became a member of Henry Scott's Minute Company of Refugio, which patrolled the Mexican border. In 1873 Saunders served as deputy sheriff under James Burk of Goliad. On July 15, 1874, he married Rachel Reeves; they had two daughters and a son who died in infancy. Within six years the family had moved from Clip to San Antonio, seeking special medical attention for Rachel, who died on February 8, 1883. During his wife's illness Saunders operated a hack line in San Antonio and did a prosperous business. Soon after her death he sold the line and, with Harry Fawcett, purchased the Narcisso Leal Live Stock Commission business, with offices opposite the Southern Hotel on Dolorosa Street. After a year of profitable business Saunders sold the commission company and began driving horses to northern markets. He returned to San Antonio in 1886 and entered the livestock-commission business in a company registered as Smith, Oliver, and Saunders. Two years later he started his own firm, and by 1910 incorporated the George W. Saunders Livestock Commission Company with offices in San Antonio, Fort Worth, Kansas City, and St. Louis. His company grossed $5 million each year. On January 1, 1889, he married Ida Friedrich; they had one daughter. When the George W. Saunders Live Stock Commission Company dissolved in 1958, it reportedly was the oldest livestock-commission firm operating continuously under the same name in Texas. In addition to his business interests Saunders supervised the management of four ranches and a farm of 700 acres. Trail Drivers' Memorial in San Antonio, by John Gutzon Borglum. Image available on the Internet and included in accordance with Title 17 U.S.C. Section 107. 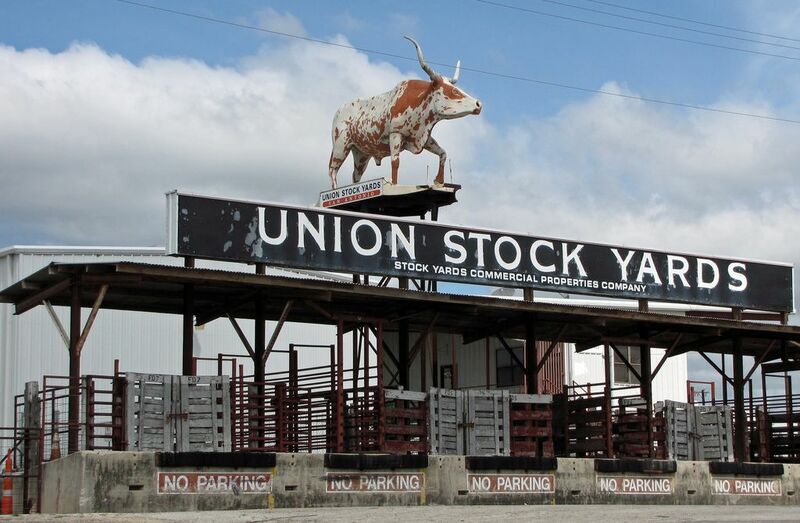 San Antonio Union Stock Yards. Image available on the Internet and included in accordance with Title 17 U.S.C. Section 107. The Trail Drivers of Texas, by J. Marvin Hunter, 1925. Image available on the Internet and included in accordance with Title 17 U.S.C. Section 107. Saunders's personal letters of that time included communication with Queen Marie of Romania, Will Rogers, J. Marvin Hunter, J. Evetts Haley, and artists Will James and John Gutzon Borglum. All recognized his expertise on the cattle industry. He was largely responsible for bringing Borglum to San Antonio in 1925 to sculpt the Trail Drivers' Memorial, Borglum's major Texas work. 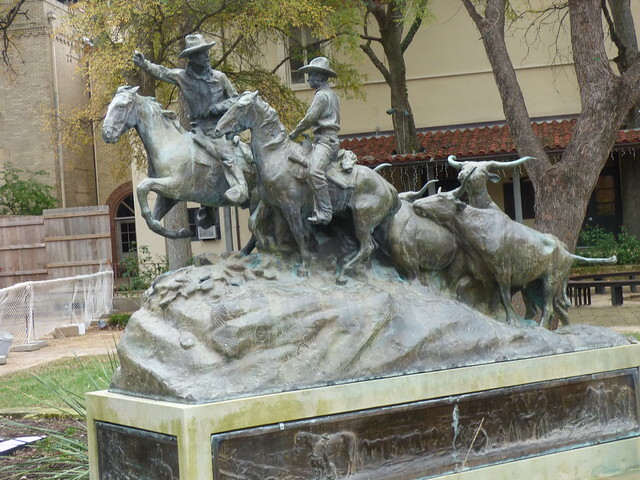 The model of the Trail Drivers' monument, unveiled in January 1926, was cast in bronze in 1940 and displayed outside Pioneer Hall near the Witte Museum. Saunders initiated one of the rodeo's most popular competitive events, roping, at the San Antonio Fair of 1892. He was instrumental in the construction in 1889 of the Union Station Stock Yards of San Antonio, which he later served as a director and general manager. As alderman of Ward Two in San Antonio in 1913 and 1914 he authored several beneficial ordinances regulating the affairs of the city and was an outstanding participant in its improvement when more than $3.5 million of bonds were sold for that purpose. During World War I he served on the local exemption board, supported war activities, and encouraged war-bond drives. The Old Trail Drivers Association of Texas was organized with Saunders as vice president on February 15, 1915. He was elected president in 1917 and served several years. He is recognized for having the foresight and initiative to be the driving force in publishing The Trail Drivers of Texas (1925), a book that has been called the principal source book on cattlemen and cattle drives. He was a member of the Southwestern Cattle Raisers' Association and the Texas Cattle Raisers' Association and contributed objects identified with the range to the Witte Museum. Saunders died on July 3, 1933, at his home in San Antonio; he had had a heart attack a few months earlier. His body lay in state at the municipal auditorium. Ellis A. Davis and Edwin H. Grobe, comps., The New Encyclopedia of Texas (4 vols., 1929?). Frontier Times, May 1928, August, September, 1933. J. Marvin Hunter, Trail Drivers of Texas (2 vols., San Antonio: Jackson Printing, 1920, 1923; 4th ed., Austin: University of Texas Press, 1985). D. J. Lightfoot, Trail Fever: The Life of a Texas Cowboy (New York: Lothrop, Lee and Shepard, 1992). A Twentieth Century History of Southwest Texas (2 vols., Chicago: Lewis, 1907). Vertical Files, Dolph Briscoe Center for American History, University of Texas at Austin. Handbook of Texas Online, Roland S. Jary, "SAUNDERS, GEORGE WASHINGTON," accessed April 18, 2019, http://www.tshaonline.org/handbook/online/articles/fsa38. Uploaded on June 15, 2010. Modified on May 17, 2017. Published by the Texas State Historical Association.